M97 and M108, a photo by S Migol on Flickr. M97 and M108 as seen on May 12 & 14, 2013. Taken at Montebello OSP on two nights. There was a third night that had bad data because of clouds and accidentally leaving the camera on ISO 400. Standard setup: SV4 and cooled Pentax K10D DSLR. My first real use of the cold-finger modified camera outside of the back yard. Thermostat was set to -10C and the EXIF temps read 14-15C on the warmer night and 10C on the cooler night. I also added flocking material to the inside of the flattener to help control off-axis flare. This latter modification seems to help significantly. Flats were generated using the LED panel but I'm considering that these are not really flat. I'll probably make a flat box repurposing the LED panel to give better and wider flats for consistency. Getting much better results with flexure, too. I've been able to mostly fix the flexure, now I just have field rotation to control. Image data is from 20 subs of 1200 seconds duration at 100 ISO. Guided and calibrated with Maxim. Stacked in DSS. Processed in PI. Field of view ..... 1d 59' 44.1" x 1d 21' 27.4"
After nearly two months, I got my gear out under the stars again and went after a nice, near-polar object, M97. 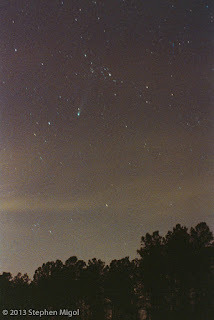 This was partly because I'd selected it as a perk for winning the Cloudy Nights Intermediate Astrophoto Challenge for Feb 2013. I got my scope up to Montebello on Saturday night - which was a wash because of the clouds and because I left the camera set to ISO 400. The usable subs for that evening were no good because when I stack with them, they inject noise into the final image. I returned on Sunday and Tuesday nights for a great session, netting nearly 7 hours of integration. The final stack looks pretty good so far. One thing I noticed when packing the scope away on Sunday night was that in the cold, the guide scope screws had become slightly loose due to the contracting metal. This was a bit dismaying, as I'd tried to keep the system tight. So on Tuesday evening, I tightened everything down before calibration and guiding. Given this change, I'm pleased to see that the flexure chart is pretty good! Note the blue bars of the measure of incremental change in the hypotenuse between exposures. This is the drift between images, causing trailing stars. Notice how they appear to be mostly less than 1 pixel. The red bars indicate the cumulative drift over the session. This averages out to a respectable .3 pixels per frame drift. Not bad at all and is likely attributed to field rotation. There was a lot of ground-level wind on Tuesday, so it's likely that the remainder of the problem is masked by induced vibration. After 5 years of owning and using a Pentax K10D, I've learned something new about the camera. I had fallen into a habit of banging away with fast shutter use - since I used the back AF button instead of the half-press - the SR system is not on for many of my shots. I did a test with the 300mm lens hand-held. I was able to see a marked improvement with shots where I paused for a second before firing the shutter. Able to get good, usable images at this focal length at 1/10 second exposure. This will make a major difference to the number of keepers for my concert photos. C/2011 L4 PANSTARRS and Errai May 5 2013 09:53 UT, a photo by S Migol on Flickr. 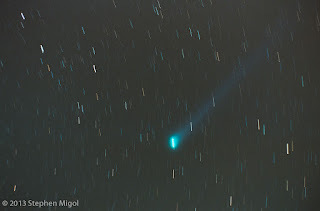 Comet PANSTARRS as seen on Sunday night/Monday morning. My only photo of this object so far. I resisted the chances to take pictures of it earlier in the season. Only once I was able to see it when up at Montebello through Yangzhe Liu's telescope did I finally take the picture. This is the sum of two 10 minute exposures tracked on the comet. I'd never tracked on a comet before and was pleased to see that Maxim kinda did OK with it. 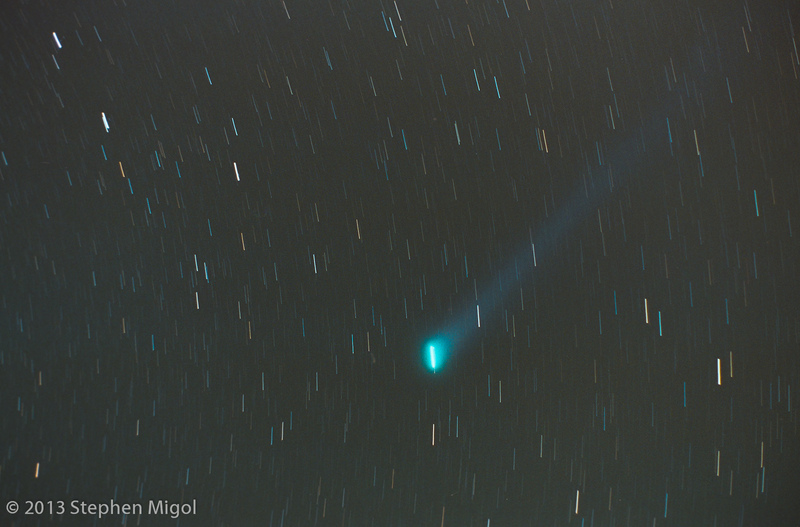 Had to stack in DSS with only two exposures and the software didn't automatically pick up on the comet location. I just stacked without alignment. Calibration was done in Maxim with some old, non-matched darks that I had. Thus there are hot pixels and bad amp glow that I removed by cropping. Final processing in Pix Insight and a pass through LR3 to remove a flare from Errai. Same hardware setup as I usually use: SV4 with the modified and cooled Pentax K10D camera set to ISO 100. The great comet of 1996 came to light again recently, at least on my light table. I uncovered some negatives recently that featured the appearance of the comet, likely at its peak in March of 1996. The details on the images are sketchy regarding focal length and settings. At least I know what camera and film were used! Both were shot on my Pentax K1000. The first was probably using the kit lens, a 50mm f2 most likely wide open. The second was probably using the 200mm Sigma zoom that I had, operating at f5 ish. Neither were guided, so I was expecting star trails. Scanned using a method similar to the one in the earlier post, however, I made a light box to use a strobe. I was getting strange results with the LED based panel and decided to go with a strobe for better balance. It's also much easier to gel for color correction and I can dial up the brightness to better penetrate dark negatives.